Nutritional disorder – boron (B) deficiency. 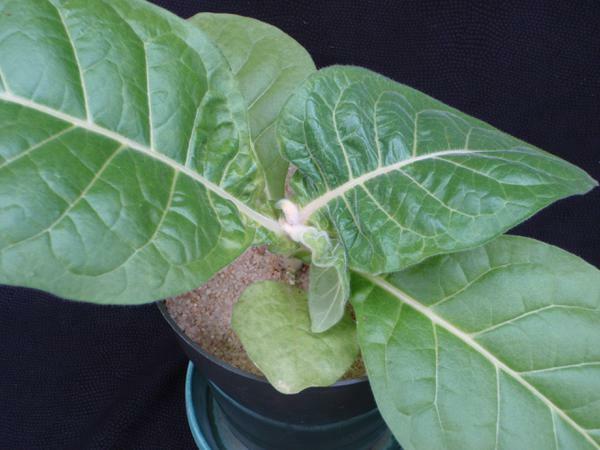 Boron (B) deficiency is easily induced in tobacco plants and manifests as a variety of unique and interesting symptoms. 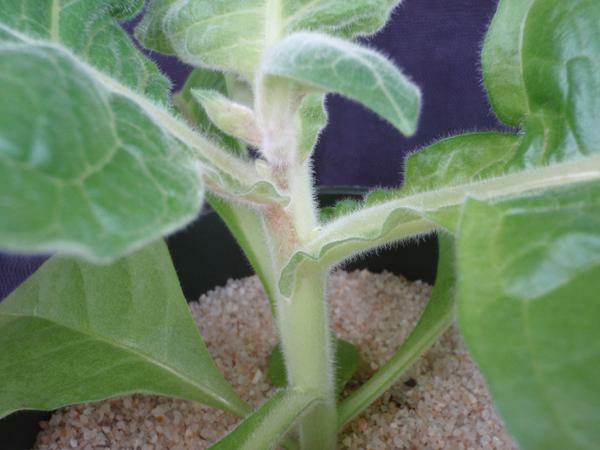 Tobacco plants that are boron deficient are stunted very early on in production when compared to healthy plants. Initial symptoms involve a noticeable distortion at the growing point. The youngest leaves will develop kinks and other unusual growth patterns (Figure 1). Additionally, the upper leaves will be very thick and brittle to the touch. It has a very distinct “ridged” feeling compared to healthy plants. Symptoms can progress very quickly once initial symptoms are observed. The distorted terminal bud will quickly become necrotic and may abscise from the plant. The older foliage will often become darker green in coloration and will also become distorted. The leaves will begin to curl downward and will take on a crinkled appearance (Figure 2). These symptoms may also be confused with calcium (Ca) deficiency, which is often accompanied by apical death and leaf distortion. The primary difference between these two deficiencies at this intermediate stage, is that calcium deficiency involves a downward curling of the leaf margins, while boron deficiency involves a downward curling of the entire leaf. These differences become easier to distinguish as symptoms advance. In advanced cases, plants are severely stunted, and the distortion of all of the foliage becomes very pronounced. The midrib of the leaves will develop perpendicular cracks that are typically closer to the main stem of the plant (Figure 3). Leaf drop occurring in lower stalk positions has also been associated with boron deficiency, as weakened midribs cannot support leaf weight. Other symptoms include a browning discoloration on the stem (Figure 4), as well as a ribbed appearance and interveinal chlorosis (Figure 5). 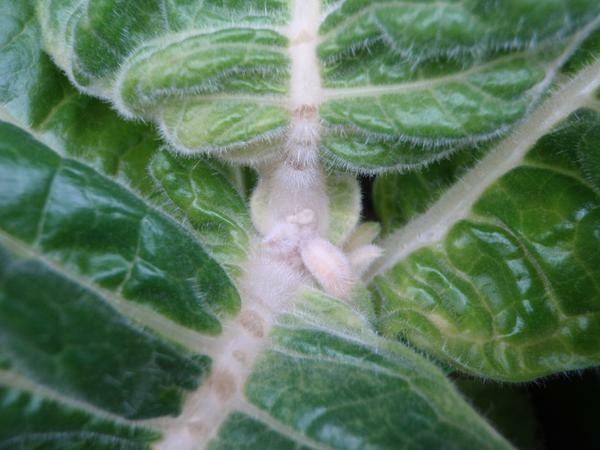 Side shoots may also begin to develop due to the loss of the apical meristem and associated apical dominance (Figure 7). Figure 1. The initial symptoms of B deficiency involve a distortion of the terminal bud. Figure 2. 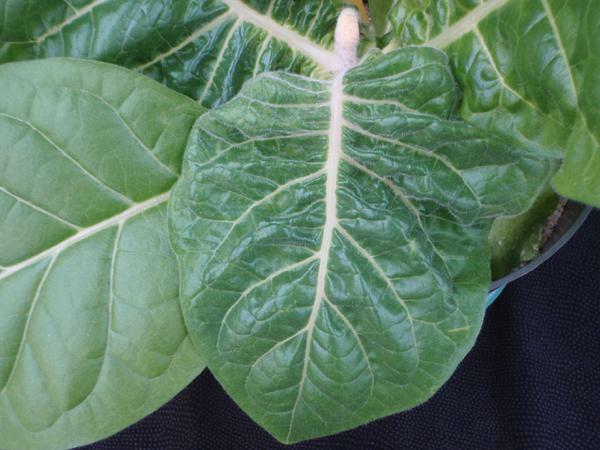 This crinkled leaf is a very common symptom of B deficiency that begins very quickly. Figure 3. 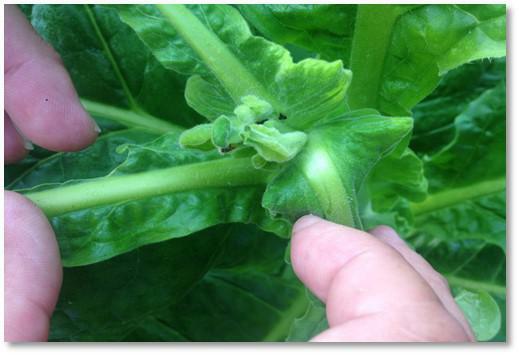 This cracking that occurs on the leaf midrib is another common symptom that may be seen in B deficient tobacco. Figure 4. Brown spotting on the stem may also occur as B deficiency symptoms progress. Figure 5. This ribbing will occur when leaf curling becomes very extreme, and the chlorosis is another symptom that occurs in advanced cases of B deficiency. Figure 6. The 360-degree view of this symptomatic B deficient tobacco may be viewed by clicking on the above picture. Figure 7. Field view of boron deficiency, here the growing tip has died and side shoots are forming. Calcium deficiency also results in distorted leaf symptoms, but in the case of limited calcium, the leaves usually have a marginal necrosis (death), which results in a cupping appearance of the youngest leaves. Drift or carryover of auxin mimicking herbicides, such as 2,4-D, Aminopyralid, Dicamba, or Picloram, can produce injury symptoms similar to those expressed by B deficiency—specifically when these materials inhibit/retard growth of the apical meristem. Tissue analysis for nutritional concentration and/or pesticide residues can assist with correct diagnosis. Good root systems and environmental conditions that encourage evapo-transpiration through the leaves will aid in the uptake of boron (and calcium). The sufficiency range for boron is between 18 and 75 ppm for burley tobacco. A slight refinement of the range is available for flue cured tobacco, with 18 to 75 ppm boron being recommended from planting until maturity, and a lower range of 18 to 30 ppm recommended at harvest. Deficiencies of boron have been documented in North Carolina. There are a number of factors, such as rainfall, soil type, and choice of fertilizer program, that likely contribute to deficiency. Producers should be aware that the range of boron deficiency and toxicity is very narrow and that the deficiency should be confirmed prior to boron application. Research has demonstrated a positive response in plants receiving 0.5 pounds of elemental boron per acre in a single foliar application of the nutrient. Alternatively, boron toxicity has occurred when foliar application rates are increased to 1.0 pound of elemental boron per acre in a single application. Producers should contact their local Extension agent if a suspected deficiency is observed and exercise extreme caution when making supplemental applications. Seedling Production. A boron deficiency causes bud distortion and death, and has been observed in several float systems. In most cases, the source water and the fertilizer do not contain any boron. The best solution to this situation is to choose a fertilizer such as a 20-10-20, with a guaranteed micronutrient charge if your water analysis indicates boron is lacking. If a fertilizer with boron is unavailable, adding no more than 0.25 ounce of Borax per 100 gallons of float water should prevent a deficiency. This application rate of Borax will add 1.5 ppm B to the float system. Field Production. Boron can be leached, especially in sandy soils with low organic matter. If applying a complete N-P-K fertilizer, sufficient boron should be provided with the inclusion of a tobacco grade micronutrient package. Common application rates of these fertilizer sources should supply 0.5 to 1.0 lbs boron/acre. Alternatively, if producers are not applying N-P-K fertilizers and are making prescription based, independent applications of N and K only, then routine tissue sampling throughout the season should be employed to accurately gauge B accumulation by plants. 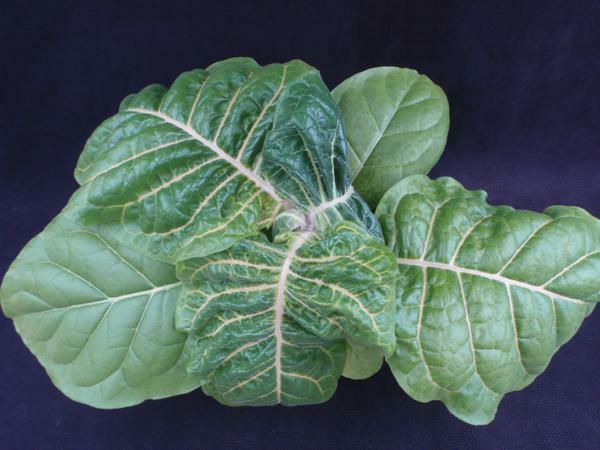 Boron deficiency of tobacco is relatively uncommon, but can be corrected through foliar applications of a boron containing fertilizer material. Growers are cautioned to apply no more than 1.0 lb B/acre as boron can be toxic to plants. It is advisable that producers apply 0.5 to 0.75 lbs boron/acre in a single application and then give plants time to respond. Subsequent applications of 0.25 to 0.50 lbs boron/acre can be applied as a follow up treatment, if needed. It is important for producers to remember that boron can always be added to the system but that it cannot be easily removed; therefore, it is advisable to take a more conservative approach when correcting a deficiency.